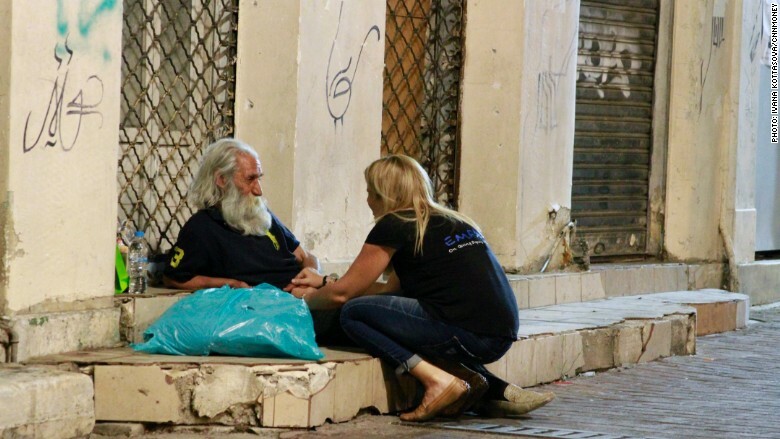 Charity worker Maria Karra talks to an elderly man who lives on the streets of Athens. Maria Karra can't believe her eyes. 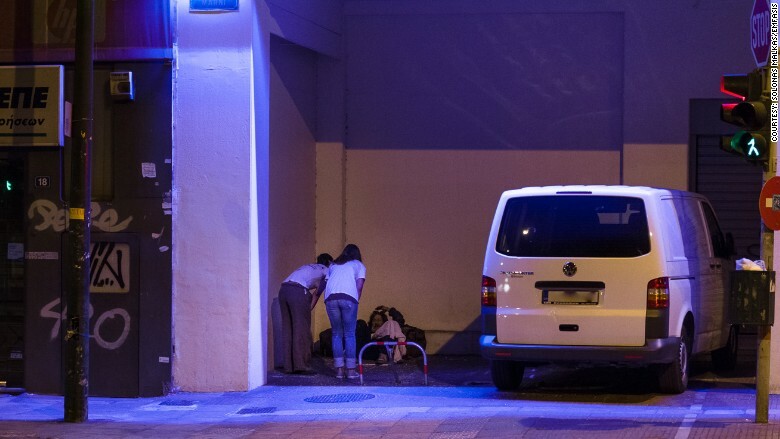 The founder of an Athens charity for the homeless says the hardship she sees daily on the city's streets reminds her of crises in much poorer countries. "I used to do this in developing countries in southeast Asia, and now I do the same in Greece, negotiating food donations -- pasta, rice, legumes, milk," she said. Karra started Emfasis with her former classmate, Tassos Smetopoulos, in 2013. The country's economic crisis was in full swing and the number of people in need of help was rising rapidly. Since then, things have only gotten worse. 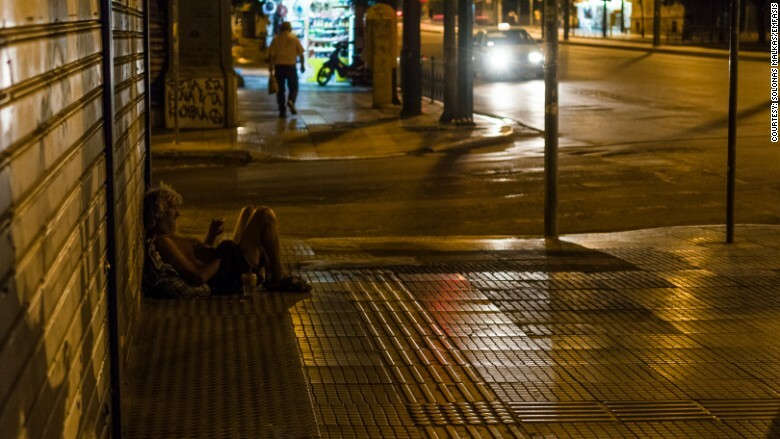 Greece now has the highest poverty rate in the European Union. 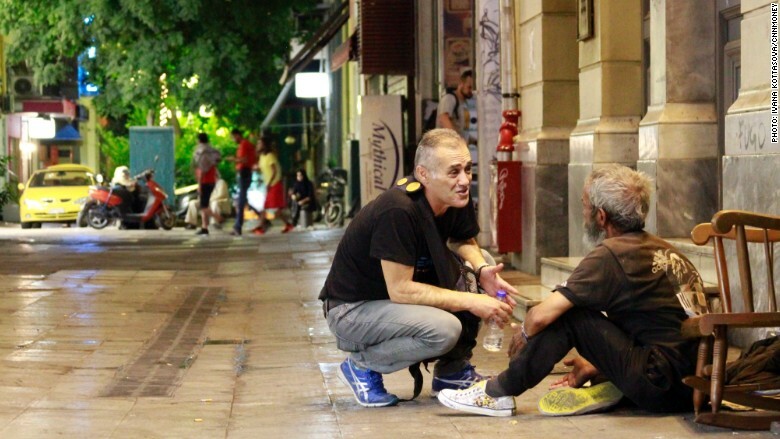 Charity worker Tassos Smetopoulos talks to Nicolas. He lost his job and couldn't keep up with his rent payments. Karra and Smetopoulos say the situation is getting worse. 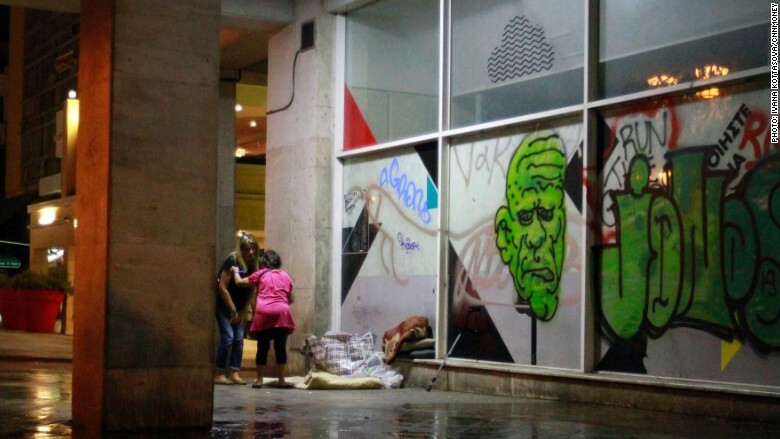 They've seen the number of people living on the streets of Athens rise by about 40% in just three months. The Greek government estimates there are now 20,000 homeless people in Athens -- among a population of 660,000. "We see a lot more young people on the streets now," Karra says. People aged between 26 and 45 now make up the biggest group of homeless in the capital city according to Emfasis. "These are people in their most productive age, living on the streets." Emfasis volunteers get ready for their night shift in Athens. Emfasis has around 110 volunteers working in Athens six days a week, trying to help those in need. They give the homeless advice on where to take a shower and how to navigate the Greek bureaucracy to access welfare. They distribute food, blankets and other basic essentials. Lately, a lot of people have been asking for books. 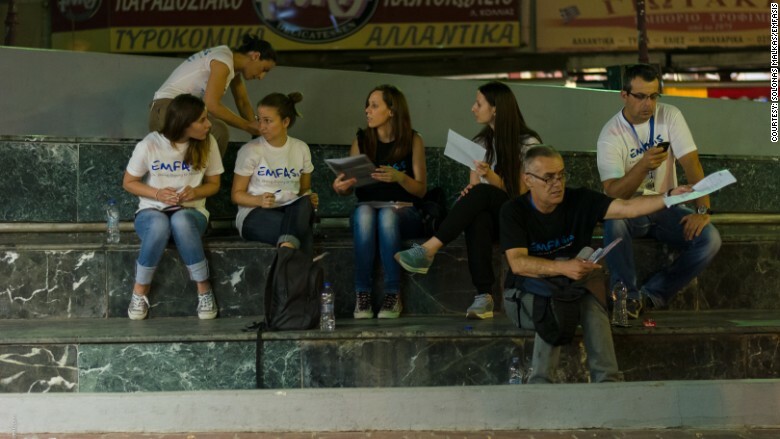 Many of the people who Emfasis helps are educated and had careers before the crisis hit. They use sophisticated language, and they want to talk about anything but their situation. Mrs. G. lives on the streets of Athens. Like many others, she found herself homeless after losing her job. Mrs. G. is a petite woman wearing a bright pink dress. She has been homeless for about a year, after losing her cleaning job. She couldn't find another position and ran out of money to pay rent. "I've never seen her so distressed, she has lost a lot of weight since I last saw her," Karra says, after helping straighten her thin sleeping mat and tidy her belongings. Mrs. G. had her food and other items stolen that day. That kind of thing happens a lot -- people leave the little they own behind while they go in search of food or the toilet, and when they get back, it's gone. "This stuff is their entire life," Karra says. "It doesn't matter that it's just some plastic bags and bits of food. It's all they have." The number of homeless people in Athens is growing every day. Smetopoulos blames the recent increase in homelessness on the economic crisis, and a massive wave of layoffs that started after Greece's first bailout in 2010. Greek unemployment rocketed from 10.6% in 2004 to 26.5% in 2014. He says it usually takes two to three years after a shock -- such as losing a job -- for people to end up on the street. That's what happened to Nicolas, who was sleeping in a central square last week. He used to work as a security guard. He started falling behind on his rent after losing his job, and without family to support him, he soon ended up on the street. With the economy collapsing, successive Greek governments have been forced to make deep cuts to the country's social services. Day centers and public mental health services have been shut. The number of social workers has been cut sharply. "Normally, we would be able to take people to a care center...but there is nothing we can do now," Smetopoulos says. "The only thing we can do is show them we care." The volunteers are trying to find ways to help the most vulnerable. Charities like Emfasis are often the only services available to the most vulnerable. "The demand is growing," Smetopoulos says, while driving around Athens in a van, distributing food to the homeless throughout the night. Each person got a cup of milk, and a sandwich or a portion of warm food -- chicken or beef donated by local supermarkets and cafes. In the two hours between midnight and 2 am, Karra and Smetopoulos distributed 70 meals. They'd be back the next night. "This crisis is just beginning now," Smetopoulos said.